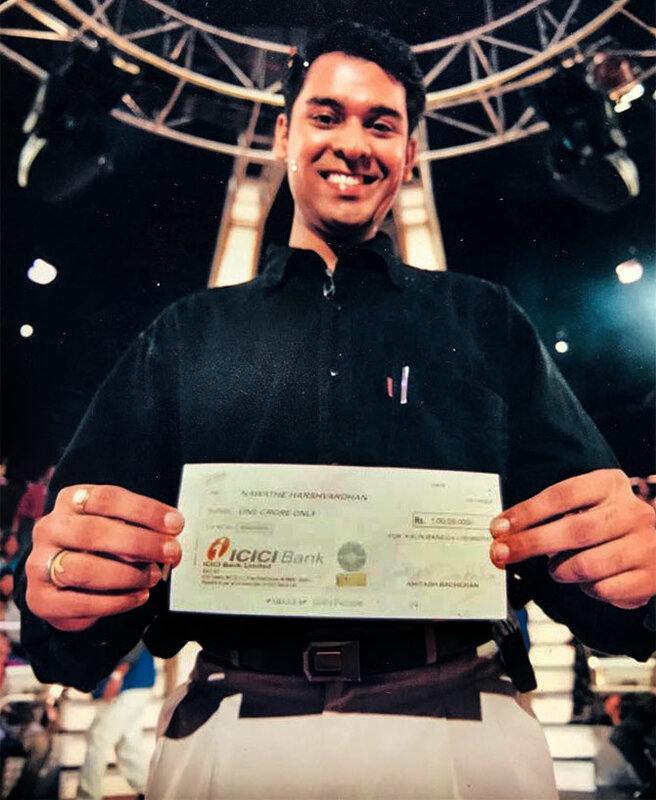 IMAGE: Harshvardhan Nawathe shows off his cheque. 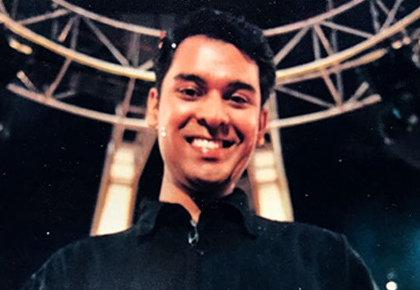 As KBC enters its 10th season, Harshvardhan tells Rediff.com's Senior Contributor Rajul Hegde, "If you have some dreams, there will be hurdles and challenges. But if you are keen to get something, you will eventually get it." You were the posterboy for Kaun Banega Crorepati, season 1. It has been 18 years! It was euphoric when I won the show. I was the first winner, so there was a lot of glamour and aura around the show. It also gives you that special feeling because the first winner is always remembered. The fact that I was young and from a middle class family added to the appeal. Plus, I was aspiring to be a civil servant. KBC gave me fame and recognition. It's something I live with almost on a daily basis. It's exciting to see the contestants on the show, who show their knowledge. I relive those memories again and again whenever the show is on air. Do people still recognise you by face? 10 to 15 percent still do. A lot of people cannot place me, so they ask questions like 'Are you a cricketer, a television journalist, or TV actor?' They can't place me, but they remember my face. Take us through your KBC journey. I was a civil service aspirant then; I was studying for the IAS examinations. When the show was being telecast, I was in Delhi preparing for it. The show was huge by the time I came back to Mumbai. I used to follow the show and answer the questions. Those days, you had to call a landline to get selected. I did all that, got selected and went there. Mr Amitabh Bachchan has been my favourite actor. I have grown up watching his movies. I can't describe how I felt when I met him. You have this image of Mr Bachchan -- he has got a God-like persona. Eventually, I won the Fastest Finger First and was sitting in front of him within 10 minutes of meeting him. It was a dream come true, but once I sat on the seat, I was focused. 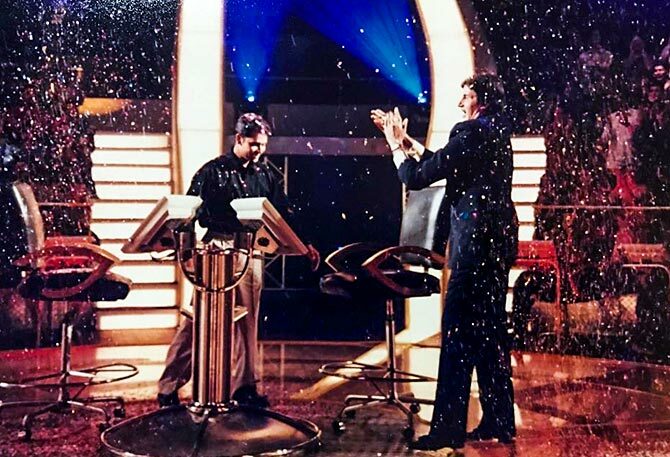 I was there for a purpose: To take part in a quiz show. I focused on the questions. I was unfazed by the people around me, it was more about answering the questions and winning. I did not focus on the money or fame. It happened so quickly -- it concluded in 22 minutes or less. When I won, there was chaos all over. After the show, I had the opportunity of spending almost an hour with Mr Bachchan. I had a heart-to-heart chat with him and he was all praise for me. He said I have to live my life differently. I had a contract with the channel, which said I could not disclose anything about the show (before the episode was telecast). But almost everyone came to know, as there are so many people in the studio audience, watching the show live. When I reached home, a neighbour visited us with a bouquet. Friends started calling me up and asking if I had won. Obviously, I had to deny it. The next day, my friends and I went out shopping for the channel's promotional shoot. I was with my friends when my mother called and said there were a lot of press people in the house, and that I should not go home then. I called up the channel and they made arrangements for me to stay in a hotel. So I was packed off to a hotel for the next 10 days, under an anonymous name. I was not allowed to go outside the hotel premises. I was just confined to the room where a few friends could meet me. Fame or recognition doesn't come easily; you have to pay the price (laughs). What happened after the episode was telecast? The show was so popular that I became a household name. Suddenly, I was thrown into the limelight, which I hadn't been prepared for. So there were press conferences, I was cutting ribbons, attending Page 3 parties, meeting the chief minister... you name a politician, I have met him. There was no phone cameras then, so people would chase you for autographs. I lived the life of a rockstar for a couple of months. I knew the fame would be short-lived, so I never allowed that to affect me or disrupt my life. I never went after it, but it came to me, and I just made the best of it. How did life change after you got the prize money? Because it was a big amount, life changed to an extent. I got a different kind of confidence. My father is a retired IPS officer. I was able to fund my studies. I went to the UK and did my MBA. That opportunity was created because of the show. The show gave me a lot of financial freedom and I have been able to take some good decisions. I bought my own house eventually. 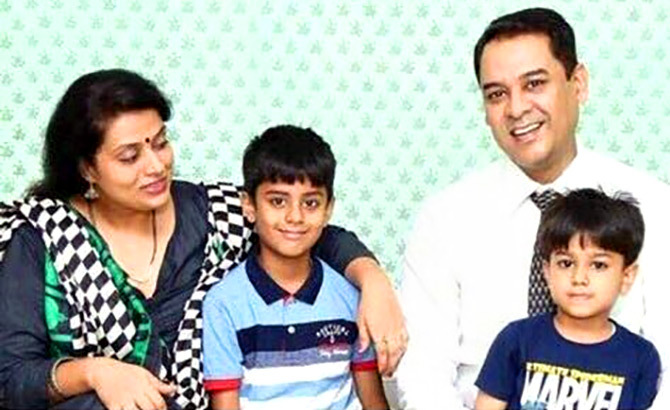 IMAGE: Harshvardhan Nawathe with his family. You were an IAS aspirant. Did that take a backseat after KBC? I was 27 years old when KBC happened. The cut-off age for the civil services was 28 then. I did not have time to get back to the grind and get the focus that you need to prepare for the IAS. I had a contract with the channel. The commitments, shows and party invites made it difficult. You need to follow a certain schedule for the IAS. I was studying hard, 15-16 hours a day, and suddenly, I was throw into glamour. It was not bad, and I have no regrets, but that took away the focus. I could not appear for the exams. Like most IAS aspirants, I had a backup plan. I was pretty sure if I did not get through, I would pursue an MBA. That's how I did my MBA, joined the corporate world, worked in infrastructure and eventually, today, I am doing what I wanted to do as an IAS officer. I wanted to work for the people. I joined an NGO, the Naandi Foundation, to experience, first hand, how grass-root projects take shape. I worked with them for a couple of years. Six years ago, I quit that and joined Mahindra and Mahindra. I shaped my career around my dreams and aspirations. Though I am not working with the government, I am closely working with public administration and government programmes that happen through CSR (Corporate Social Responsibility). Do you still watch KBC? Do your kids know that you are its first winner? Whenever time permits, I watch. I have two sons -- one is 9 and the other one is 5. They follow KBC, and they know I won because every time the show starts, I have to give interviews. My elder son has met Mr Bachchan. My wife is a Marathi actress, she is doing a daily soap currently. Are you in touch with anyone from the KBC team? I am in touch with producer Siddhartha Basu, but not on a regular basis. At times, I go on the sets to say hello to Mr Bachchan. The new season has a tagline, 'Kab Tak Rokoge'. What is your Kab Tak Rokoge moment? I haven't allowed circumstances to overpower me; I am living the life I wanted to. Even in terms of my career, which was the biggest jolt to me. I was someone, who had wanted all his life to be a civil servant. I had watched my father do his work and I was truly inspired. Somewhere, I felt I missed that opportunity, but I eventually turned it around into an opportunity for myself. If you have some dreams and aspirations, there will be hurdles and challenges. But if you are keen to get something, you will eventually get it.